Time flies when you’re having fun! And, at Twins Daily, we’ve been having a lot of fun, and hopefully you have too. It is hard to believe that in the next week, Twins Daily will turn five years old. In fact, when one of the Twins Daily owners recently mentioned that we were about to turn five, we all did a double-take. Fortunately, we had the screenshot from the first day to prove it has been five years. Over the next few days, we’ll be sharing our thoughts on our old sites, Twins Daily, and some of our favorite things about this community. And that community is what Twins Daily really is all about, at least in my opinion. When John, Parker, Nick and I first started meeting and discussing consolidating our individual blogs, we spoke frequently about building a community of Twins fans. 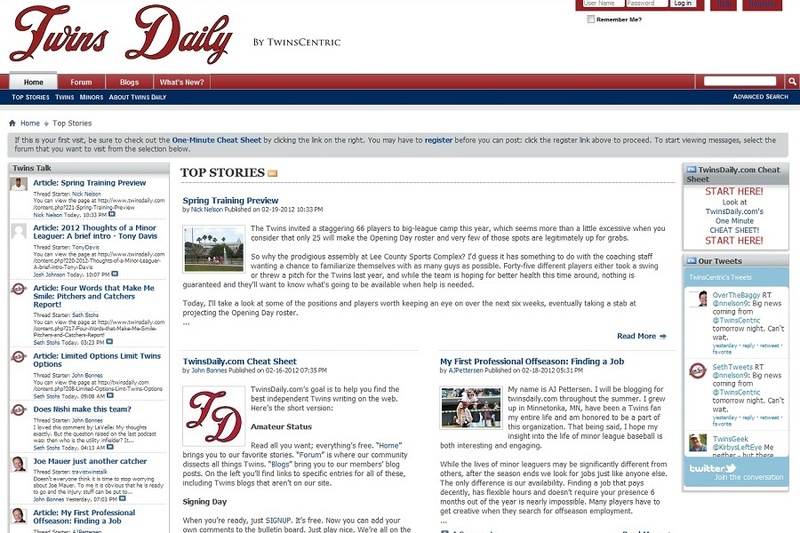 As you can see from the Day 1 web page, Twins Daily has come a long ways in five years. Arguably the best decision in Twins Daily history was bringing on Brock Beauchamp. OK, not arguably. It was. Note that this is Part 1 of a series of articles. Each of the Twins Daily owners will share their thoughts on the site's first five years and what it has meant to them. I think I speak for all of the owners when I say that I am proud of the Twins Daily site and the community that has grown over our first five years. In May of 2003, SethSpeaks.net began. It started, in large part, thanks to the old Twins Geek site. Maybe some of you even remember the old Dickie Thon Twins Fan Forum. I figured I was a baseball guy with a lot of years of playing, but also a willingness to listen to other thoughts and ideas. At the time, SethSpeaks.net was a baseball blog, but I also wrote about basketball, football, movies, TV, and generally whatever I wanted. I figured that I wanted a site that represented me, and that would be something I would want to read. I just hoped eventually a few others might read and that we could discuss and share ideas. Over time, SethSpeaks.net became much more TwinsCentric (hmmm… that’s an interesting name). I began diving further and further into the minor leagues. One of my favorite things to do on that site and on Twins Daily is doing Q&As with players, getting to know the minor leaguers. Of course, when I started doing that at SethSpeaks.net in the mid-’00s, things were different. I actually hand-wrote letters with questions for players and sent them to the minor league affiliates’ media relation types. I got responses from some players, including Kevin Slowey, Matt Garza and others. As we have moved ahead, social media has made it a lot easier. I admit, sometimes I miss what SethSpeaks.net was. There were some great relationships that grew from e-mail (people can still e-mail me, my e-mail address is on this site, in my profile). But at Twins Daily, the community is wonderful (most of the time). Through our get togethers and through the events such as the Winter Meltdown, it has been wonderful getting to know so many of the Twins Daily readers. It’s always nice hearing people come up and introduce themselves and say Thank You. And, even more, it’s nice being able to say Thank You to our readers in person. And though that isn’t possible to say Thank You in person to everyone, well, you can read it here. I really do Thank You for all of the support, not only over the last five years, but the support I’ve felt for almost 13 years. Being a part of Twins Daily has provided many opportunities. I know I’m looking forward to getting down to Ft. Myers again in March to cover the Twins and the minor league fields for our Reports from The Fort. The Twins have been very accepting of Twins Daily, and that means a lot and is very appreciated. It’s been wonderful to earn the respect (hopefully) of the terrific Twins beat writers. It’s been fun getting to work with people from each of the Twins affiliates, especially those in Cedar Rapids where I enjoy spending 3-4 days each summer too. It's been fun going to fantastic events like Twins Fest and the Diamond Awards. I am proud to be a part of Twins Daily. Sure, it has had its ups and downs, as does everything, but I am proud. The thing that I am most proud of is that I believe that Twins Daily is the go-to place online for Twins minor league information. I’m excited that we’ll be doing daily minor league reports again in 2017. We get tremendous feedback on those daily reports from our readers and I know that the players and their families enjoy reading them as well. Thank you to Jeremy Nygaard, Cody Christie, Eric Pleiss and Steve Lein for helping to write those. Also thank you to Steve Buhr in Cedar Rapids for his great Kernels articles. And Jeremy Nygaard’s work makes Twins Daily the best spot for MLB (and Twins-specific) draft information. I have always believed that the minor leaguers deserve credit for the work they put in. Those who have purchased the annual Twins Prospect Handbook know that it means a lot to me. That’s why I want to do Q&As and Get To Know ‘Em interviews with players, top prospects or not. They all deserve that. It’s always fun for me to get to know players when they get drafted and watch them grow on and off the field. Many don’t get to the big leagues, but it’s always fun to see guys who put in their time get an opportunity in the big leagues. Likewise, it has been a lot of fun to watch Twins Daily grow over the past five years. I think we are willing to try new things in the internet era, both on our site, on social media, and in our events. It’s been fun to watch how the site, the audience, the events and the fun has all grown. I remember 1987 and 1991 very well. I enjoyed the years from 2001 through 2010. These last few years have been tough (which again makes me glad that I enjoy following the minor leagues! ), but hopefully things will turn around, starting in 2017. We are all Twins fans, first and foremost. Hopefully our passion shines through in our writing - whether it is positive or negative. Part of the allure of Twins Daily was that I wouldn’t have to write five or more times each week as I did at SethSpeaks.net. Well, looking at the numbers, I’ve been still writing 5-10 articles every week. Why? Because I enjoy it. So again, as we celebrate five years of Twins Daily, I just want to say thank you to everyone who makes this such a special place, a place I enjoy checking out many times each day. Congratulations to the founders of TD and Brock. You have created something special here. It might be interesting to hear what you expected at the outset and how things are different from what you imagined. I didn't really have any expectations. I was curious... I hadn't really kept track of how many page views I had on SethSpeaks.net, so when I started seeing some of the page view numbers at Twins Daily, it was very exciting. The surprise has been some of the doors that it has opened. This is the one site I visit daily if I only have time to goof off on the internet. Thank you guys for the quality content you produce. Congratulations to you and your co-workers. You've created a place that is very addictive to some of us others who love the game as you all clearly do. Damn. I'm old. I remember the ESPN boards (Elysian fields), BYTO, and now here. Dis a nice lil site y'all got here. You guys are the best. Twins fandom is so much better because of you and your site. Keep up the great work! Because of this web site and all the owners and contributors, I don't feel so isolated, as the biggest Twins fan here in North Carolina. In North Carolina we have news about the Panthers, the Hornets/Bobcats/Hornets, the Hurricanes, the beloved Tarheels and the hated Duke (rhymes with puke) Blue Devils. As far as news in North Carolina, there is nothing, nada, zero, zip about the Twins. Now with TD I can access wonderful Twins' news, pictures, videos, rumors (thanks DaveW) and most importantly, intelligent discussions, anytime of day or night. I can actually be a part of the discussions. I can even suggest a topic for discussion and get responses from other Twins fans. I feel at TD I havea group of friends with whom I can share intelligent and positive (mostly) thoughts and ideas aboutthe Twins. Thinking back on my life, I realize how important pulling for the Senators, and now Twins, has been for me. I've enjoyed every minute of being a Twins fan...even the years when the Twins had a poor won/lost record. Those years of being a Senators' fan before they moved to Minneapolis, steeled me for long seasons of many losses. So I salute you, TD owners. Thanks for everything. And as Bob Hope would have said: "Thanks for the memories". See you in Fort Myers in 10 days! Thanks for the site guys. It's the first page I check in the morning during the season (slips to maybe the 2nd or 3rd over the winter). It's been a saving grace over the past 6 years of losing with the Twins. A while ago I searched the internet to see if other MLB teams had similar sites, and I was happy to see that TD really is in a class by itself. Nothing makes one feel like time is moving a bit too quickly than realizing you've been coming to and commenting on the same site for five years (especially when it feels like the site just launched a year ago). Twins Daily has created a great community of Minnesota Twins fans, and the work and perspective shared on these pages is second to none. Here's to many more years of talking Twins baseball! So who was in the doghouse on Valentine's Day 5 years ago where they decided to launch this site? Congrats Twins Daily! You're now old enough to send you to Kindergarten! Strange that there was no mention of BYTO in the write up. Didn't most of the original visitor traffic come from there? Malcolm Gladwell would be pleased. I spent the first 10 years of my life in South Dakota, where I learned the game and became a Twins fan via my father, which I have mentioned before. I am fortunate enough that my 40+ years while living in Nebraska I can still receive most Twins games via the radio. A little over 5 years ago I discovered Sethspeaks and other websites to follow the Twins and their milb affiliates more easily than scouring over snippets in various printed materials, (though some like Baseball America and others did provide quality information). I am hopelessly addicted to my beloved Twins and this website. I visit often daily and my tablet and phone are probably weary from all the refreshing I do on daily basis, lol. THANK YOU to everyone, not just the owners, but all who share here, for a fantastic site and community! My answer to an above question, one I've been meaning to ask for a long time, is what the hell is BYTO? Buy Yellow Tomatoes Only? Build Your Tostada Omelette? Baste Your Two Ovaries? Blame Yonder Taliban Organization? I'm out of Y words. My virtual journey went Simmons-Batgirl-Gleeman-Seth-Nick/John/Parker. Thanks for doing it, TD. By "it" I mean go hang out in Florida. No clue.The sites were competitors for a while. All five of us are writing an article leading up to the fifth anniversary. As you'd expect, mine will be more BYTO-specific. The original traffic streamed in from the four original blogs that we combined into TD (mine, Parker's, Seth's and John's). BYTO didn't get folded into the site until a year in or so, but it was certainly a huge boost for the forums, and obviously the addition of Brock was a huge boost for the design, as you can tell by that hideous day 1 layout. It has been awesome to be a part of, Seth. Very much appreciate all the opportunities to help that are given to me. And I'll get you to spell my name right eventually! Haha. Congrats on 5 years. Remarkable! i echo the sentiments here in my appreciation for everyone who contributes on a regular basis. I too, check this site daily, and have learned quite a bit, not just from the owners who write, but everyone who posts, and also the people who choose to comment. I always feel well armed at the random happy hour with my friends. Keep up the great work, and my hope is, as you get more access to the Twins, that you continue to press to get information from a fans perspective, and remember that most of us on this site, appreciate your opinions, and the facts. Not always the Twins company line (which I think other media outlets all too redily spout). This has been a great site to debate, vent, celebrate (although not often enough recently), without being too preachy. I hope you all continue to let us do our thing. Thanks again, and here's to many more years of success. BYTO was folded into TD a little under four months after the TD launch (mid-June). It was pretty fast and furious there for awhile. I thought it was 6+ months but we must have been in discussions to merge the site within three-ish months of TD's launch. It took me at least 2-3 weeks to begin preparations to fold BYTO into TD.